Mother Sparsh Baby Soap is manufactured using all natural ingredients. This baby soap provides total nourishment and effectively cleanses delicate skin of infants by not irritating or harming it. 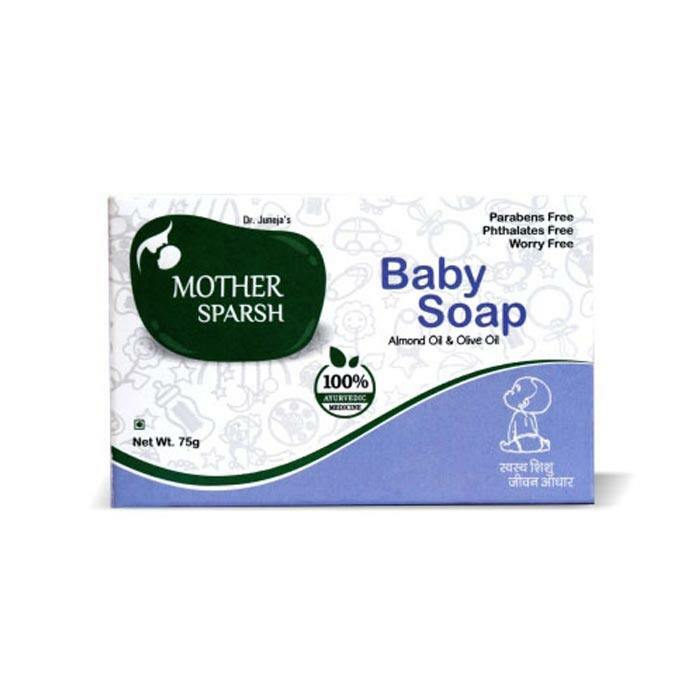 Mother Sparsh baby soap cleanses baby skin gently by leaving it supple, smooth and hydrated. It has the goodness of natural ingredients like Aloe-Vera, olive oil, wheat germ oil and Almond oil. 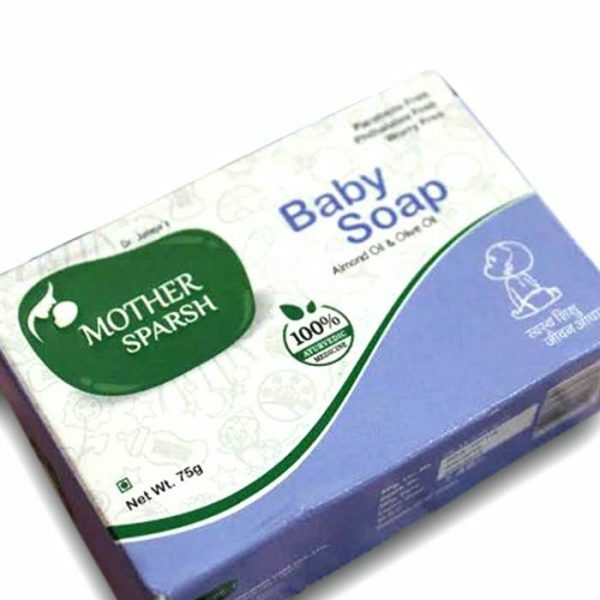 Mother Sparsh baby soap is soothing and mild, it helps to replenish the lost moisture and also cleans baby skin. It prevents baby’s soft skin from any allergic rashes and also provides enough moisture to skin. • Wet body and face with water. • Apply the soap generously, till lather forms and then wash with water. Aloe Vera, Almond oil, Olive oil, Wheat germ oil. Mothersparsh is passionate about developing amazing products that are filled with goodness of natural ayurvedic ingredients. The product range is most effective, safe & also trusted by mothers. In fact, the mission of the brand is to develop quality products that help in growing healthier generation babies. After a lot of research and studies, classic formulations as described in Ayurveda have been processed by blending with modern technology. This is done by maintaining appropriate proportions of the active ingredients present in the herbs. The products are safe, effective and also 100% ayurvedic. 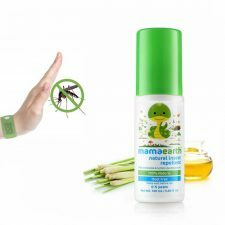 The brand understands concern of baby health and hygiene and hence designs the products specifically for baby’s delicate skin. Furthermore, this approved ayurvedic range of baby care comprises of Mother Sparsh Baby Lotion, Water Wipes, Lal tail, Gripe Water, Baby Powder, Janam Ghutti, Baby Body Wash and Baby Soap. 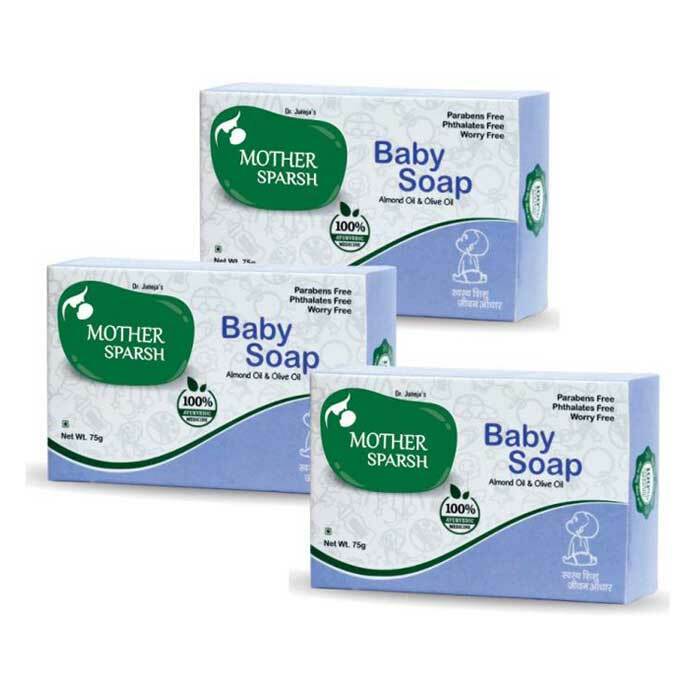 Mother Sparsh Baby Soap is free from phthalates and parabens so it is completely safe for babies. 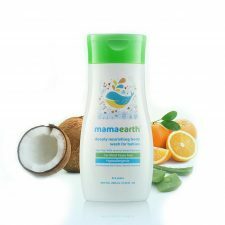 It helps to replenish the lost moisture and also cleans baby’s skin. This soap cleans the skin gently while mildly moisturizing it. In fact, it also lathers up quite well. Mother Sparsh Baby Soap has a very nice smell, not too strong but it lingers on to the baby skin even after a bath. • Helps to remove skin pigmentation marks. • Helps to deeply cleanse or nourish the skin. • Rich in Vitamins (A, D, E) and fatty acids (Linoleic acid, Ursolic acid,Oleic acid). • Light and pleasant scent. • Also helps to relieve from dry skin. • Helps to cleans oil and dirt from your skin. • Gentle exfoliation removes any dead skin cells, leaving skin ultra-clean and very smooth & supple. • Also helps to relieve from various skin problems. • It contains the goodness of omega-3 fatty acids and Vitamin B complex.